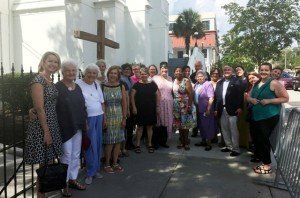 The Sisters of Charity Foundation of Cleveland and the Sisters of Charity Foundation of South Carolina co-sponsored the Assembly of Catholic Foundations (ACF) Conference in Charleston, South Carolina in June. The ACF Conference is an annual conference for Catholic foundations to gather to build capacity, network and renew their spirits for their work ahead. Representatives from Catholic grantmaking foundations from across the country took part in the three-day conference. Attendees heard a presentation from Sister Judith Ann Karam, CSA, and congregational leader of the Sisters of Charity of Saint Augustine. Rev. Bill Stanfield, CEO of Metanoia Community Development Corporation, presented “Asset Building in a Community” and Barbara Kelly Duncan, CEO, Carolina Youth Development, presented “Racial Challenges and Healing in Charleston.” The final day featured a panel discussing immigration, refugees and human trafficking. The day wrapped up with the presentation “Mercy and Kindness Shall Meet” from Sister Sandra Makowski, SSMN, chancellor, Diocese of Charleston, SC, and author of the book: The Side of Kindness. One of the highlights of the conference was a site visit to Mother Emanuel AME Church, which was the location of the tragic shooting of nine church members in June 2015. Members of the group toured the church and then had an hour-long discussion with one of the church leaders. The ACF is in its 18th year and will continue to bring together funders in the future to talk about topics and issues that will help improve Catholic philanthropy across the country. The Sisters of Charity Foundation of Cleveland and the Sisters of Charity Foundation of South Carolina are ministries of the Sisters of Charity Health System.